Excellent book, would have gotten 5 stars if it were not for the fact that some of it seems like a Shaklee catalog! Not a book about saving energy or reducing your carbon footprint, although there is a bit of that at the end. Most of it is about all the toxic chemicals we are using in our daily lives! I found it very difficult to read, in that, it talks about all the carcinogens we are all using on a daily basis. I already knew some of the stuff, but was totally freaked out by most of the rest of it! No one really knows just how dangerous all these chemicals are as most of the 80,000 of them registered with the EPA have not been tested for safety, the government has no control over their usage and does not even require them to be listed in the ingredients, as they are trade secrets. Anything that says "fragrance" on the label can be hiding many toxic chemicals! One of those will most certainly be phthalates, which have recently been in the news for being used a plastic softeners, used in baby bottles and toys, in addition to many other items! The FDA regulates personal-care and beauty products, but corporations are essentially free to combine any ingredients they want, without proving they are safe! Most of these chemicals have been banned in other countries, including the EU. BPA (bisphenol A) is another baby bottle no-no! You can tell if any plastic container has this if the recycling label is a 7. They say 7's account fo 95% of the market, look for 1,2,4 or 5's for safer products if you use plastic instead of glass. The 3's aren't good for anyone either as they contain PVC (polyvinyl chloride). 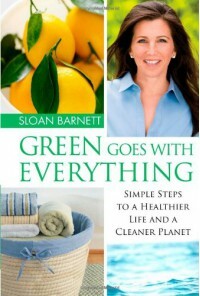 This book covers just about every product that we use, from bedding to clothing, cleaners, food, carpets, paint, etc. It is really frightening and makes me wonder about the US government and why they are letting these toxins be consumed! The author gives lots of alternatives, from buying safe products to making your own. GreenGoesWithEverything.com is supposed to be kept up to date with all the latest info. Scared the $()#& out of me! Would definitely recommend this one to anyone concerned with what they are using, eating and breathing!